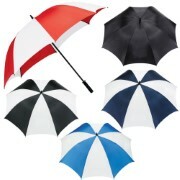 Manual opening umbrella with large canopy and matching colour case with shoulder strap. Available in 5 colours. We would love to help you with a custom quote. Mention NOTTAGE-SB1001BK. Just call 1800 674 722 or get a custom quote.